In this photo you will see a picture of me wearing the costume. I was inspired to make this from the original Spiderman 2 film with Tobey Maguire. 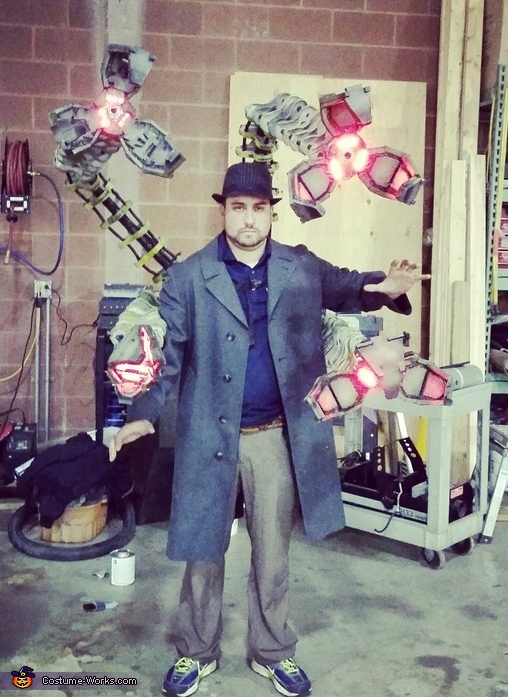 Although I ran out of time to make the tentacles move, and the pinches open and close, the costume "bounces" when I walk! There are 12 small striped of LEDs that I glued to the entire piece. Only three per arm. I soldered the entire system together and ran the wires down the black tubing and connected it all inside the jacket. The final piece runs to about 8 aaa batteries that are inside my jacket pocket. In total, this project took about 150 hours to make and around $130. I could of saved a lot of time by casting the pieces rather than cutting each one individually out, but the cost would have increased significantly. If anyone would like a more detailed version of the build, with some templates for sizes, email me larry86@icloud.com. I will try to answer it as best as I can. My first large buold. I wore it at a work function and got over 40 pics one night! I am happy with metallic dry brushing technique I used to made it look more realistic.